For cheese sauce, melt butter over medium heat in a medium pot. Whisk in flour and let cook for 1-2 minutes until it’s a light, tan color. Slowly whisk in milk until sauce is thick. Whisk out any lumps that form. Add grated cheeses (cheddar, Pepper Jack, and Provolone) and melt. Season sauce with salt and pepper and keep warm over low heat. Form ground beef into 6 (1/3-pound) burgers. Season well with salt and pepper. Cook burgers on a hot grill for 4-5 minutes per side until cooked through to desired temperature or cook in a cast iron skillet over medium-high heat. When burgers are 1-2 minutes away from desired doneness, add a slice of Colby Jack cheese to each burger. Toast buns and smear each bun with some of the cheese sauce. 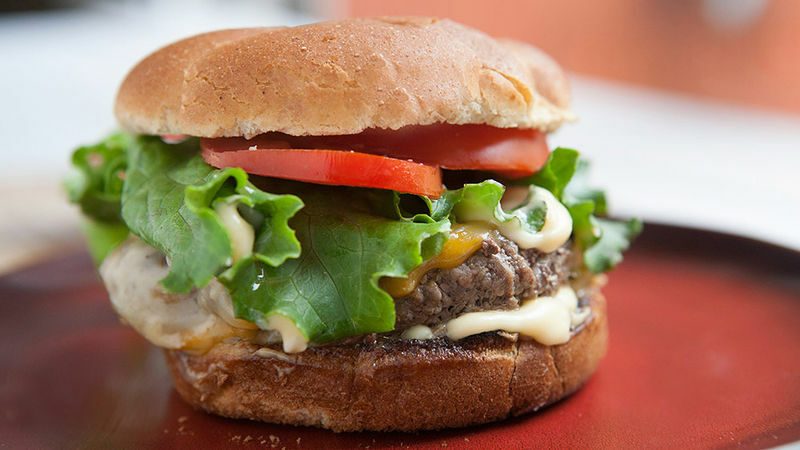 Serve burgers with lettuce and tomato and extra cheese sauce.